The Malé night market will continue despite the Anti Corruption Commission’s (ACC) instruction not to continue with the deal, the Malé City Council has said. Deputy Mayor Shifa Mohamed told Minivan News their legal advisors had told them that the ACC does not have the authority stop the agreement with GoMedia from going ahead. “They asked us to stop certain things, but it has to be finalised from the court,” Shifa said. “So according to legal officers the Supreme Court has taken a role in saying the ACC is not a place to stop any projects,” she stated. Shifa referred to a Supreme Court verdict in September 2013 in which the apex court said the ACC does not have the authority to stop a contract between the Maldives government and a Malaysian mobile security firm Nexbis to establish a border control system. The ACC is consequently planning to take legal action against the Council and GoMedia. Speaking to Vnews, ACC President Hassan Luthufee said that the Go Media agreement should not be followed by any means and that the agreement’s maintenance was a direct attempt to abet a criminal offense. “We have forwarded the Go Media case to PG (Prosecutor General) Office for prosecution. If the present Malé City Council members are speaking with this intent, we have to investigate and prosecute them as well,” Luthufee said. 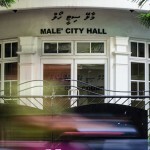 The ACC had stated that the agreement made between Malé City Council and Go Media was compiled in manner that favored some parties and paved way for possible corruption. However, Shifa yesterday stated that investigations into corruption had not been carried out sufficiently, and questioned the thoroughness of the ACC’s research. “The Major has sent letter telling [ACC] to redo the whole investigation,” revealed Shifa. The arrangements for the market are well underway with many of the stalls already let out to traders, and stopping the plans now could damage many small business owners, Shifa said. GoMedia has rented out 450 stalls and three canteens at the rate of MVR 4000 (US$ 259) each. “The ACC’s main responsibility is to check if the project is going on properly,” Shifa continued. She explained that any grievances the ACC may have should be put forth to the Prosecutor General. Alleged? You are joking right? Wow, even a red-handed arrest, a full confession, and a lengthy deliberated conviction would not deter the controllers from signing and proceeding with mega projects, if the process gives them side benefits. Alleged has zero meaning. Nada. Zilch.